Turn your old mobile phone into cash with Vodafone Buyback. Any network is welcome and the cash could be in our bank on the same day that Vodafone receive your mobile. Vodafone Buyback also offer a price match guarantee. For more information visit the Vodafone Buyback website. i have a blackberry 9500 box with all the thing that go with it its not damage it is blocked due to beeing on contract would like to know how much you would give me for it. as i would like to put the money towards blackberry 9300 red. please get black to me as soon as posable.. Sorry, I’ve updated the links on the page now. 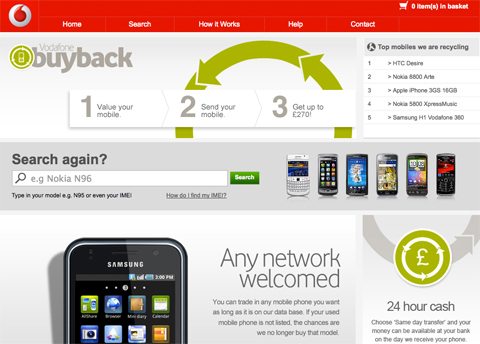 Click the image on the page or the link below it to take you to the Vodafone Buyback page.